Helix’s four-game winning streak is not much of a surprise — the Highlanders (5-3, 3-0 Grossmont Hills) have been one of San Diego’s premier high school football programs for years. The surprise was Helix’s 2-3 start to the season. Head coach Robbie Owens said the rough patch was a learning experience for the Highlanders, who were ranked No. 1 in the Union-Tribune’s preseason poll. Helix’s three losses should be taken with a grain of salt. Cajon (7-1, 3-0 conf.) is the 15th-best team in California and 83rd in the nation according to MaxPreps.com. Saguaro (7-1, 3-0 conf.) is the ninth-ranked team in Arizona, where the Sabercats won last year’s class 4A state title. Longtime local powerhouse Cathedral Catholic (7-1, 2-0 conf.) is ranked 17th in California and 100th nationally. Even with the losses, the Highlanders are third in the latest U-T poll and MaxPreps has them ranked fifth in the San Diego Section. Owens said the U-T poll (MaxPreps rankings are based on a formula that includes strength of schedule) shows how much respect they earned with their grueling schedule. Helix’s lightning-shortened 27-0 win over Grossmont (2-6, 1-2 Grossmont Hills) last Friday is an example of how much the team has learned. Senior offensive lineman Isaiah Jatta said the offensive line had to adjust mid-game to Grossmont’s pre-snap movement. The offensive line’s adjustments opened up the offense for quarterbacks Daniel Amon, a senior and Delshawn Traylor, a junior. Owens rotates the two quarterbacks and sometimes lines up Traylor as a receiver or running back with Amon under center. On one such play, Amon tossed the ball to junior running back Elelyon Noa, who ran left and pitched it back to Traylor on a reverse. Traylor ran a few steps before firing a 31-yard touchdown pass to wide open junior receiver Kamryn Brown to put Helix ahead 17-0 with 5:35 left in the first quarter. Traylor also had a 2-yard touchdown run earlier in the game. 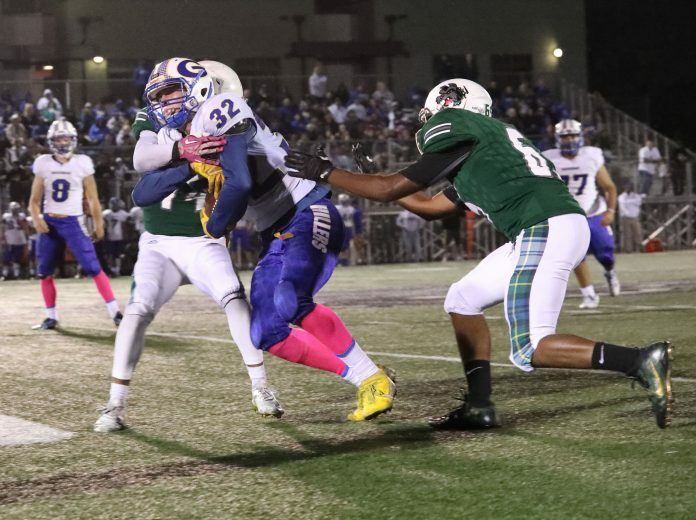 The Highlanders defense stifled the Foothillers. Senior linebacker Jacob Ray intercepted the first pass Grossmont junior quarterback Jaime Odom threw, and Helix did not allow a positive offensive play until it was already ahead 17-0. “We did a tremendous job defensively, tackled in space, played some of their trick plays really well which has kind of been an Achilles heel for us,” Owens said. The next two weeks will be the biggest in-conference tests for Helix with a game at Granite Hills (8-0, 3-0 Grossmont Hills) this Friday before closing the regular season against Steele Canyon (6-2, 2-1 Grossmont Hills). Helix has not played Granite Hills, ranked 11th in the San Diego Section by MaxPreps, since the 2013 season — the Eagles played in the Grossmont Valley League from 2014-17 before switching back to the Grossmont Hills League this season.